SYRACUSE - Cat Barber has all the respect in the world for Louisville, calling his next opponent "a great team.'' That said, the North Carolina State point guard did offer a little friendly advice for Rick Pitino. "If I was any coach from any team, I wouldn't press me,'' said Barber, the floor leader of a team that caught fire by beating Louisville during the ACC season, then kept blazing with a massive comeback over LSU to start the NCAA Tournament and a knockout of No. 1 seed Villanova. It is all about speed, the 6-2 sophomore from Newport News, Virginia, said. Barber could not be contained in a 74-65 win at Louisville on Valentine's Day and insists he still has plenty of heart ready for the rematch in the Sweet 16 Friday night at the Carrier Dome. The real turn for North Carolina State (22-13) has been in its confidence since beating Louisville (26-8). 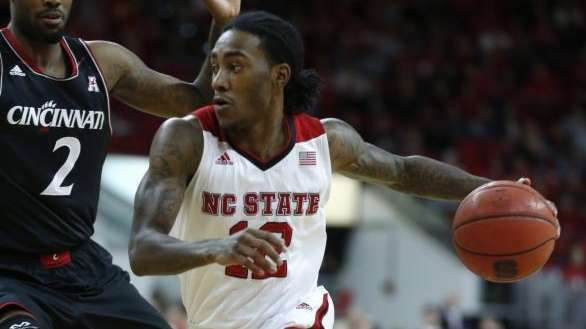 The Wolfpack believes, largely because of how Barber has asserted himself. His coach and teammates insist he is just effervescent, not boastful. Nerve comes naturally for someone who had no fear of a hot stovetop when he was 4. Anthony Barber stood on the oven, trying to get at oatmeal cream pies in the cabinet. His team made a name for itself when it beat the Villanova Wildcats last week. Gottfried cited the boost from rallying late from 14 down to beat LSU. "When you win one like that, sometimes that can be a catapult for you. I was with UCLA in '95 when Tyus Edney went 94 feet in 4.5 seconds [to beat Missouri]. Sometimes there's a game that gives you a whole different pep in the step,'' said the coach whose team now feels as if it has nine lives.